For this week’s Manicure Monday, I was inspired by Pinterest. 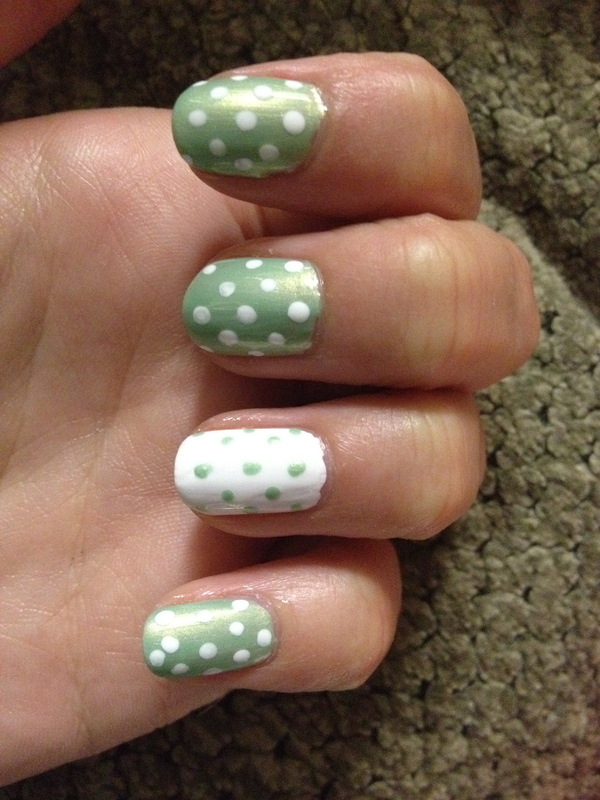 I’m not quite sure who pinned what, but I know I saw polka dots and needed to try it. Who doesn’t love some good ol’ fashioned polka dots? I wasn’t sure how to achieve this look without clumping gobs of polish onto my nail (which would happen if I used a brush). I searched all over the place for a tool I could use to achieve the perfect polka dot. A pen? Would ruin the pen. A tiny paint brush? I’m not that good. A prong from a plastic fork? Yes, I actually thought about that. No, it didn’t work. Curious to find out what I used? Read on. So what is the perfect polka dotting nail tool? A bobbi pin. Here’s how I completed the look. I wanted an accent nail, so I started off by choosing two coordinating colors. 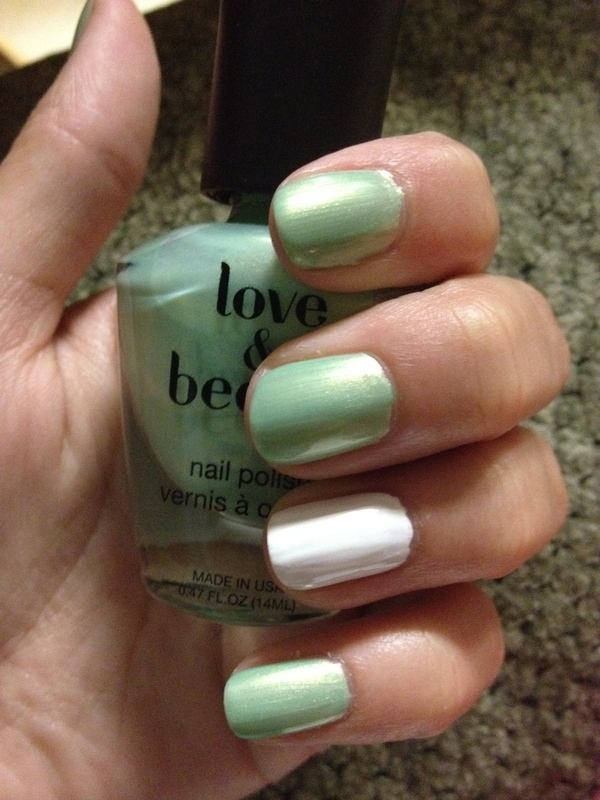 For my color, I used Forever 21’s Love & Beauty Nail Polish in Mint. For my accent, I chose Wet n Wild’s French White Creme. White pretty much coordinates with everything. This white is actually a very stark, matte white, which I thought contrasted well with the shimmer in the Mint polish. Regardless, the colors you choose are up to you! As usual, I prepped with a base coat (I used Seche Natural this time and I LOVE it – possibly my new favorite base coat), followed by two coats of my color on each nail. 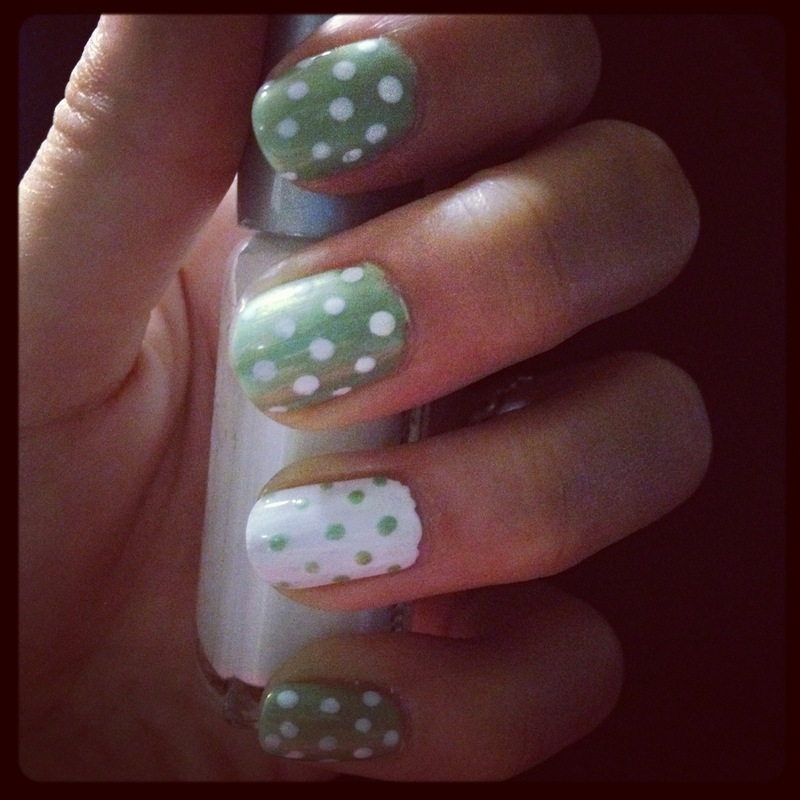 To create the polka dots, you want to lightly dip your bobbi pin into the alternate color (on Mint nails, create white polka dots, and vice versa). You will need to re-dip the bobbi pin after every couple of dots because you want to make sure all the dots are even. Don’t try to load a lot of polish onto the pin, though, because you’ll end up with a big glob instead of a polka dot. Take your time, and I promise it’ll come out great. Patience here is key. You can now go back – you may want to use another bobbi pin, or the other prong of the bobbi pin – and create the polka dots on your accent nail. The finished result is very classy, very retro – but I think the accent nail kicks this look up! Would you rock polka dots? 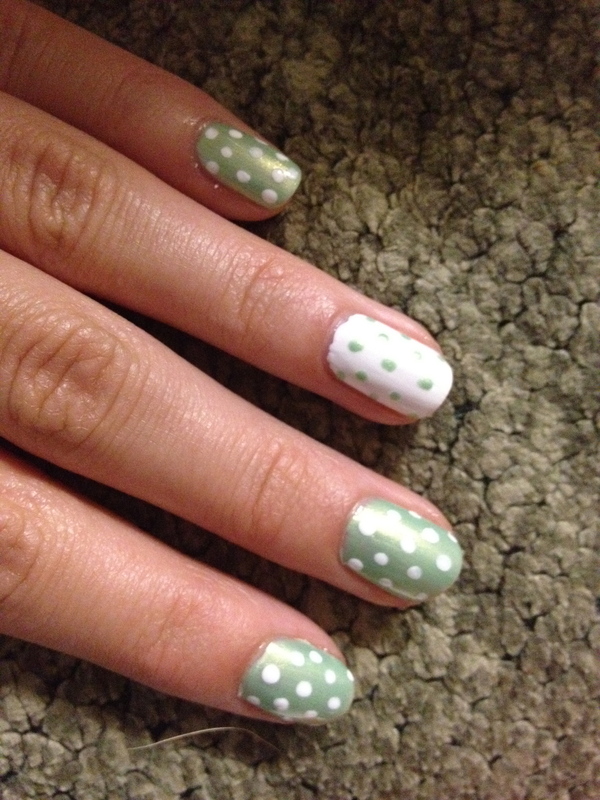 This is a cool way to do polka dots, which continue to be huge. This is my favorite one of your mani mondays yet! This is adorable: smart move with the bobbi pins, btw. You know I would have ended up with the plastic fork.